This project involves student construction and operation of basic submersibles. A detailed construction manual, compiled by MIT Sea Grant, includes sources and prices of materials and components. This project promotes STEM concepts and enables students to master basic skills such as soldering, wiring and frame construction. It is also designed to promote student innovation. 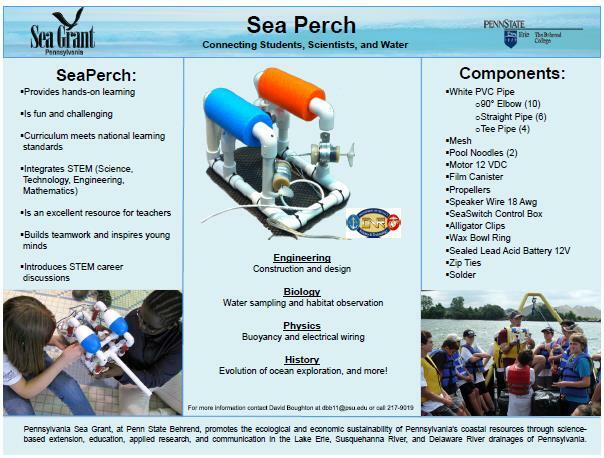 PA Sea Grant has been facilitating robotic labs with students since 2009 and has built hundreds of units with students in the 4-12 grade levels. A full course can be facilitated which includes bouyancy testing, sea trial competition in pools and final applications from a research vessel to support testing and monitoring of Lake projects.